We were a little surprised to hear that Sony Ericsson was adding a new touchscreen phone to its Walkman line with the Yendo - but now we've had some hands on time, it kind of makes sense. Essentially it's the Xperia X10 Mini with the Android bit stripped out - but the Timescape-style overlay still remains, apparently. 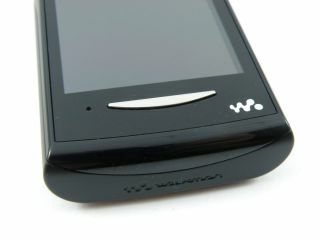 We say apparently as we weren't allowed to turn it on at Sony Ericsson's request, due to the software not being ready. But from the chassis alone, it feels like a much more premium product than expected, especially when it's likely to come in a price point fairly south of £200. Like the recent slew of Sony Ericsson handsets, the 'human curvature' feature is back, meaning it sits very nicely in the hand, although we can imagine it will be a little bit small in the hand. It does feel a bit more plasticky than other models, which makes sense given the price point - and the resistive touchscreen feels a bit flimsy too. There's no flash for the 2MP camera, highlighting the phone's primary function - the fact it's really there for music and not much else. It looks fairly similar compared to the Xperia X10 Mini Pro, and like for like we reckon some people would struggle to tell the difference - probably more with the Xperia X10 Mini than the keyboard version though. However, there's a slot for a microSD card, so memory expansion is possible - plus the headphone slot is nicely placed for the pocket. It's an interesting reboot to the Walkman brand, and one that could pay dividends if the price is right.